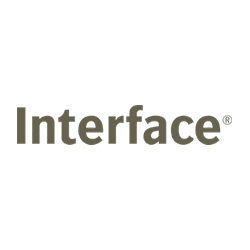 Interface are the world’s largest manufacturer of commercial carpet tile. Leading the industry with design, innovation and sustainability. Interface are especially proud of their achievements in sustainability. For example, having decreased CO2-emissions in their European manufacturing locations by 98% since 1996 and using zero water in the production process. Every carpet tile installation offers the benefits of modularity: less waste during installation, selective replacement and easy maintenance. Their TacTiles® glue-free installation system gets rid of the smell and mess of liquid adhesives during installation. Design has come a long way since we invented the carpet tile in the 1950s. Their modular carpet is available in squares as well as Skinny Planks and can be used to establish a wide range of aesthetics, from a uniform wall-to-wall installation to eclectic ‘design-by-tile’. Their designs are informed by science as well as trends. Interface, continuously try to learn from nature. As an example, the use of biomimicry when creating new products. Random designs are one of the results: carpet tiles that can be installed in a random pattern and replaced without matching dye lots, decreasing waste and saving time during installation and the life of the product.